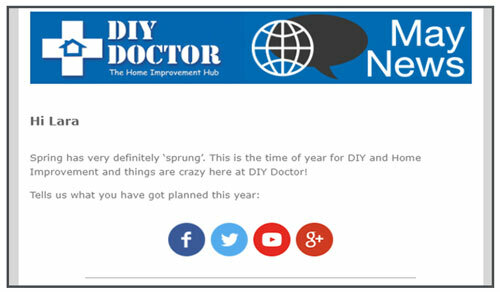 So, what’s in The DIY Doctor Newsletters? In every email there is heaps of information, advice, tips, reminders and much more. We try to make our newsletters seasonal and interesting. We will give you information about the latest offers and competitions that we are running. We work really hard putting these emails together so that you find them interesting and helpful, so we always love to hear from people that receive them. Just reply if you have any questions or comments and we’ll get back to you as soon as we can. Suggestions about what you’d like to see are always welcome too. 3 Newsletters for the price of one – FREE! This has all the up to date information from not only DIY Doctor but also around the web. There’s lots of articles about the sorts of home improvement projects that you should be tackling at that time of year, up dates on competitions, and a smattering of interesting and informative video to help you or give you the confidence to tackle the next project. You can also get free tickets to the shows that we attend all around the country. Find out more about these shows by going to our home page and checking out the "Upcoming Events" section in the right column. 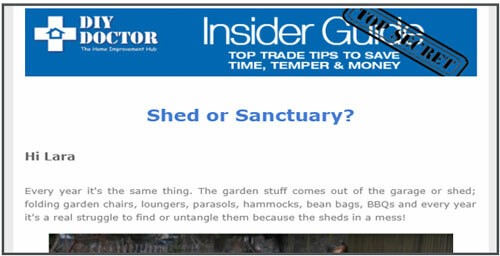 This is a newsletter which follows the story of a DIY-er and their particular project; in this case Mr DIYer (get it!?). We highlight the tools that you will need for these projects and where you can get the information to complete the project. This is a practical email for practical people. This email also lets you know about any special offers that we have and where to get them. Whenever we discover a new product, software, or service that we think will help you and is a cut above what is already out there we want to tell you. As you can imagine this doesn’t happen that often but when it does, we send you a DIY Doctor’s Discoveries Email. We try to get these product into our store or get you a special discount for finding out about them through us. We take time to prepare the emails that we send you so they wont come too thick and fast. But if they do, please scroll to the end of the email and you will be able to unsubscribe and you will no longer receive any emails from us. We don’t want this to happen, but of course we know it does happen, so we want to be sure that we’re only sending to people that want our emails. These emails and the information that we provide on our website are free for anyone to read and use. We fund this free information through advertisers that sponsor our website and from time to time, our emails. This is why you will see the occasional advertisement. Its really easy – just fill out the form (at the top of this page) and we will do the rest. Sit back and enjoy all the home improvement news, information and bargains that you could ever wish for! Thanks for being part of the DIY Doctor community – Happy DIY-ing!